The TSSG group was founded in 1996 within Waterford Institute of Technology. Since then, it has grown into a large research centre (over 35 active projects, nearly 40 completed projects, 115 active staff and students 1996-2006). This makes the WIT-TSSG unique in the Irish research landscape, as it has a very high level trans-disciplinary view of the communications services space, linking the science of the key basic research questions with the engineering expertise to create innovative prototype solutions in collaboration with mainly European partners, and combining all this with the entrepreneurial business vision to exploit a range of commercial opportunities that result. 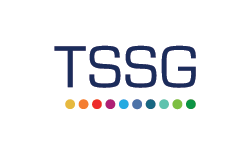 The Telecommunication Software and Systems Group (TSSG) is an internationally recognised centre of excellence for ICT research and innovation. Our core expertise focuses on telecoms networks, security and mobile services. Our research teams comprise some of Ireland’s leading telecommunications and software engineering experts; this knowledge and expertise has enabled us to work with academic and industry leaders from around the globe. Our partners include Nokia, Ericsson, Nokia Siemens Networks and Alcatel-Lucent – as well as Tier 1 operators including Telefónica/O2, T-Mobile, T-Systems (a division of Deutsche Telekom), Telecom Italia, Vodafone, Telenor Group and Portugal Telecom and many more.